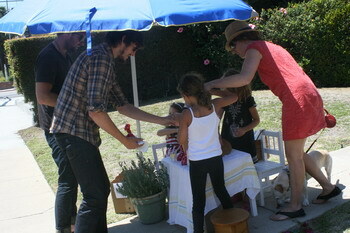 This was the first time that I saw one of these fabled, very American, lemonade stands in action. What a marvelous teaching tool for children! These three young girls learned about patience, money matters, how to be nice to customers, how to advertise and how to withstand the heat, because they were selling lemonade for a good cause. It’s like a course in Business Economics and customer service in the front yard – but much more fun.